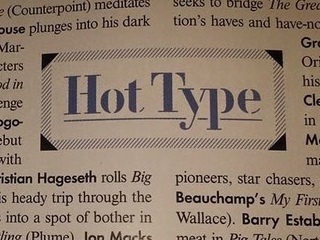 Author is taking over Vanity Fair's "Hot Type" column. In February, Universal Pictures optioned the rights for Sloane Crosley’s acclaimed 2015 debut novel The Clasp. Tomorrow, the paperback edition arrives. And beginning with the October issue of Vanity Fair, Crosley will be on board as a contributing editor, succeeding book columnist Elissa Schappell as the publication’s chronicler of “Hot Type.” She knows the literary beat from all angles, having spent a dozen years in book publishing, mostly with Vintage/Anchor Books. The announcement of her appointment was made today. “A Sudden Illness” by Laura Hillenbrand – This is one of my favorite essays of all time. I’ve used it to teach narrative non-fiction. I needed to send it to one of my old students and so that’s why it’s open. Long live Laura Hillenbrand! The essay was published in the July 7, 2003 edition of The New Yorker. Schappell revealed last month via Facebook that she was moving on from Vanity Fair.